Often the feasibility of using stem cells for regenerative therapies is limited by two factors: obtaining a significant number of cells and doing so in a relatively noninvasive manner. Because our bodies freely shed a limited and select number of cells, many stem cell types must be obtained using a rather invasive procedure. However, around the beginning of last year two laboratories independently reported the discovery of a new type of stem cell that may overcome both obstacles; stem cells were found to reside in menstrual blood (Meng et al., 2007; Patel et al., 2008). These stem cells, termed endometrial regenerative cells (ERCs), are not only harvested in a noninvasive manner and relatively readily available in large quantities, but they potentially overcome the problem of immune rejection in many female patients as well. 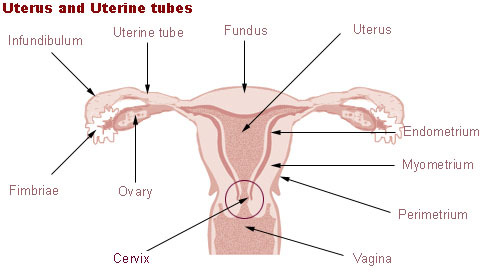 The uterus is lined by a layer of cells called the endometrium. During the menstrual cycle, the endometrium cycles between thickening and being broken down if fertilization does not occur. The break down and expulsion of the endometrium is called menstruation, or menstrual bleeding, and is the source of endometrial regenerative cells (ERCs). Researchers suspected stem cells to be present in menstrual blood because stem cells were previously found to be present in the lining of the uterus. 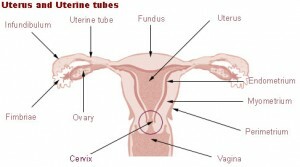 The wall of the uterus is lined by a layer of cells called the endometrium (see figure). To create ideal conditions for the uterus to accept and nurture an embryo, the endometrium lining becomes thicker and increases the number of blood vessels and glands within it. However, if implantation does not occur, the endometrium lining is broken down and shed. Overall, the endometrium is quite a hyperproliferative tissue, continuously being broken down and rebuilt; it is an ideal tissue to investigate for the presence of stem cells. In the menstrual cycle, the shedding is known as menstruation, or menstrual bleeding; the excreted menstrual blood is made up of blood as well as cells from the endometrium layer. Researchers previously reported the presence of stem cells in the intact endometrium lining of the uterus (Cho et al., 2004; Schwab et al., 2005; Du and Taylor, 2007). Because stem cells were found in the endometrium, researchers thought it likely that stem cells could also be found in the shed endometrium in the form of menstrual blood, which can be obtained in relatively large quantities in a much less invasive manner. However, the stem cells discovered in menstrual blood, ERCs, appear to be rather different from stem cells derived from the intact endometrium. While stem cells from the intact endometrium appear to be mesenchymal stem cells (MSCs, as discussed earlier), ERCs do not; they are distinctly different not only in their undifferentiated state, but in the cells they can differentiate into as well. Researchers categorize stem cells into certain groups based off of, among other factors, their cell morphology and the proteins they express. An established stem cell group usually expresses a distinct set of proteins. ERCs, though morphologically appearing mesenchymal, were found to express only some, but not all, proteins characteristic of MSCs. Additionally, ERCs were reported to be able to differentiate into, or become, cells from the three different germ layers (see the previous post on MSCs for more details): mesoderm (muscle, bone, fat, cartilage, and endothelial cells), ectoderm (neurons), and endoderm (liver, pancreas, and lung cells) (Meng et al., 2007; Patel et al., 2008). However, the mesenchymal stem cells from the intact endometrium cannot generate cells from all three germ layers. Overall, ERCs were determined to be functionally distinct from endometrium MSCs (Meng et al., 2007; Hida et al., 2008). Though ERCs do not appear to be MSCs, the stem cell category ERCs best fall into still remains unclear, along with several other basic answers concerning their stem cell identity. In addition to MSC proteins, ERCs were also negative for proteins characteristic of hematopoietic stem cells, which are cells that give rise to the hematopoietic system, as discussed previously. However, ERCs were, surprisingly, positive for some proteins distinctive of embryonic stem cells (Meng et al., 2007; Patel et al., 2008). The expression of these embryonic stem cell proteins is quite unusual in adult stem cells, or stem cells derived from adult tissues, such as ERCs (Patel et al., 2008). The presence of embryonic stem cell proteins in ERCs, combined with ability of ERCs to differentiate into the three germ layers, led one research group to label them pluripotent (Meng et al., 2007), though others only refer to them as multipotent (Patel et al., 2008). A pluripotent stem cell is generally one that is able differentiate into cells from any of the three germ layers, while multipotent stem cells can only differentiate into cells from one or two of the germ layers. Most adult stem cells are only multipotent. If the ERCs are indeed pluripotent, they may have a greater potential for cell-based therapies than if only multipotent. Some reported characterization discrepancies of the ERCs have led researchers to suspect that there may be a bit of variability in the quality of ERCs isolated, possibly depending on many suspected factors, though none have been fully investigated yet. Since there was not a standard method of isolation in place for these cells, there could be great variability in the actual cells isolated depending on the specifics of the isolation method used. Additionally, the quality and potency of ERCs isolated could depend on the individual donors, possibly being related to age or other factors, though this is currently untested (Patel and Silva, 2008). In the menstrual blood, ERCs make up a portion of the total cells present and are mainly selected for from this collection of cells by their ability to grow on tissue culture-treated plastic. Other cell populations within this fluid have not been fully investigated; it is quite possible that the subpopulations of cells in this fluid, including the ERCs, may also vary significantly between donors (Patel and Silva, 2008). To complicate the identity of these stem cells even further, it has been suggested that there may be multiple different stem cell populations in the menstrual blood, as researchers have had some conflicting protein expression results (Patel and Silva, 2008). Lastly, the origin of these stem cells is still much up for debate. Some researchers theorize that the ERCs are shed endometrium stem cells (Patel et al., 2008), though, as discussed above, they are rather distinct from these cells, while other researchers hypothesize the ERCs originate in the endometrial glands, as many glands are observed in menstrual blood (Hida et al., 2008). With a better understanding of the origins of these cells in the body, and potential variability between donors, it will be easier to properly isolate the ERCs for use in down-stream applications. Though many questions remain to be answered to accurately characterize these newly discovered stem cells, a great amount of interest in using these cells for regenerative therapies has already materialized. Researchers are currently looking into using ERCs for treating neurodegenerative and cardiovascular diseases (Hida et al., 2008; Patel and Silva, 2008) and salvaging limbs (Angle, 2008; Murphy et al., 2008), among several other applications (Zhang et al., 2009). Preliminary clinical trials for treating multiple sclerosis in humans using ERCs have already yielded some promising results (Zhong et al., 2009). Several industries, including Cryo-Cell International and Medistem Laboratories, have also quickly realized the great potential of these cells and are researching their use in prospective applications. Overall, ERCs hold great promise as a significant reservoir of stem cells obtained in a noninvasive manner that can often be patient-specific, with some evidence even suggesting them to be immune privileged, or less likely to cause an immune reaction than other stem cells (Patel and Silva, 2008; Zhong et al., 2009). Angle , N. Regenerative Medicine with Endometrial Regenerative Cells for Critical Ischemia: Limb Salvage from the Cradle of Life? Future Card. 2008. 4(6): 547-550. Cho, N. H., Park, Y. K., Kim, Y. T., Yang, H., and Kim, S. K. Lifetime Expression of Stem Cell Markers in the Uterine Endometrium. Fert. and Steril. 2004. 81(2): 403-7. Du, H. and Taylor, H. S. Contribution of Bone Marrow-Derived Stem Cells to Endometrium and Endometriosis. Stem Cells. 2007. 25(8): 2082-6. Hida, N., Nishiyama, N., Miyoshi, S., Kira, S., Segawa, K., Uyama, T., Mori, T., Miyado, K., Ikegami, Y., Cui, C., Kiyono, T., Kyo, S., Shimizu, T., Okano, T., Sakamoto, M., Ogawa, S., and Umezawa, A. Novel Cardiac Precursor-Like Cells from Human Menstrual. Stem Cells. 2008. 26: 1695–704. Meng, X., Ichim, T. E., Zhong, J., Rogers, A., Yin, Z., Jackson, J., Wang, H., Ge, W., Bogin, V., Chan K. W., Thébaud, B., and Riordan, N. H. J. Endometrial Regenerative Cells: A Novel Stem Cell Population. Transl. Med. 2007. 5:57. Murphy, M. P., Wang, H., Patel, A. N., Kambhampati, S., Angle, N., Chan, K., Marleau, A. M., Pyszniak, A., Carrier, E., Ichim, T. E., and Riordan, N. H. Allogeneic Endometrial Regenerative Cells: An “Off the Shelf Solution” for Critical Limb Ischemia? J. of Transl. Med. 2008. 6: 45. Patel, A. N., Park, E., Kuzman, M., Benetti, F., Silva, F. J., and Allickson, J. G. Multipotent Menstrual Blood Stromal Stem Cells: Isolation, Characterization, and Differentiation. Cell Transpl. 2008. 17: 303–11. Patel, A. N. and Silva, F. Menstrual Blood Stromal Cells: The Potential for Regenerative Medicine. Regen. Med. 2008. 3(4): 443-4. Schwab, K. E., Chan, R. W. S., and Gargett, C. E. Putative Stem Cell Activity of Human Endometrial Epithelial and Stromal Cells During the Menstrual Cycle. Fert. and Steril. 2005. 84(2): 1124-30. Zhang, M., Liu, B., Xia, W., Sun, Z., and Lu, K. Could Cells from Menstrual Blood be a New Source for Cell-Based Therapies? Med. Hypoth. 2009. 72(3): 252-4. Zhong, Z., Patel, A. N., Ichim, T. E., Riordan, N. H., Wang, H. Min, W., Woods, E. J., Reid, M., Mansilla, E., Marin, G. H., Drago, H., Murphy, M. P., and Minev, B. Feasibility Investigation of Allogeneic Endometrial Regenerative Cells. J Transl Med. 2009. 7: 15. Original “The Human Uterus” image from the Wikimedia Commons and redistributed freely as it is in the public domain. admin	Endometrial Regenerative Cells	adult, clinical trials, embryonic, hematopoietic, mesenchymal, news, regenerative medicine	© 2009-2010, Teisha Rowland. All rights reserved. As a readily available source of stem cells, this is quite an interesting research finding. It will be interesting to understand how much material is available in this manner as it could, in the future, allow women to store some of these stem cells for potential treatment against unknown diseases at a later age.